Bailee Madison wears black and red high top Converse “Chuck Taylor” All Stars in the film. Sam and Tyler are best friends. Tyler Doherty (Tanner Maguire) has cancer. He’s gotten through most of his chemotherapy and is about to restart school, though he’s lost all his hair. It’s been difficult for him, as well as his extremely loving family. To cope, Tyler, who has a tremendous amount of faith, writes letters to God, which he gives to the postman. “It’s like texting your best friend,” he explains. In his letters, Tyler expresses his worries and his prayers for his family. Mailman Brady is touched by Tyler’s letters. 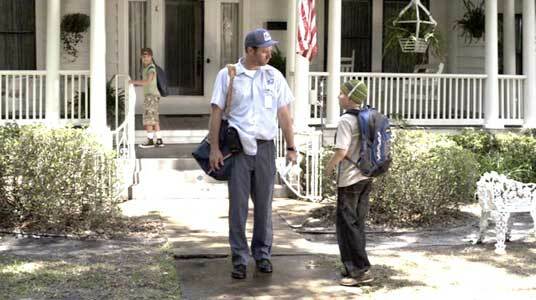 The letters are received by McDaniels (Jeffrey Johnson), an alcoholic postman who lost custody of his child and has little faith. Easily, McDaniel friends Tyler and his mom, Maddy (Robyn Lively), and begins reading Tyler’s letters. They don’t immediately rekindle his own faith, just helps him better understand the kid. Also in Tyler’s life are best friend Sam (too precious Bailee Madison) and her grumpy grandpa Mr. Perryfield (Ralph Waite, from “The Waltons”). In school, rough Sam beats up an intolerant jerk who is teasing Tyler, while Grandpa explains to Tyler that he’s God’s warrior. Grandpa explains this while wearing “Russian” costume and makeup. He then gives Tyler fake eyebrows, which passes as whimsy in this film. Tyler checks out his new eyebrows. Meanwhile, Grandma Olivia (Maree Cheatham) explains to Tyler’s excluded older brother Ben (Michael Bolten) that “We have it harder.” Maddy worries some. And Tyler writes a letter to the bully, saying he forgives him and that he hopes “God will open a window in his heart.” They later become friends. Tyler’s devotion inspires Ben and the bully to write their own letters to God. Completing his treatments and given a clean bill of health from his doctors, Tyler’s released. Family and friends hold a costume party welcoming him back, and Tyler dons fake brows again. Eventually, Tyler feels good enough that he and McDaniels are able to convince Maddy to let the boy play soccer. He makes the winning save, but then collapses. He’s dying, and this “challenges” everyone. Tyler also doesn’t get anymore dialogue. Maddy blames McDaniels, and McDaniels loses hope. But, everyone regain their hopes and smiles anew. McDaniels shares Tyler’s inspiring letters to God with everyone on the block, and hold a concert for him at a camp for terminally ill children. Having said goodbye to everyone, Tyler passes away with resignation, his faith unfaltering and his family and friends stronger. A ceremony is held later, unveiling Tyler’s mailbox. Sam plays checkers with her grandfather. Letters to God is superficial and syrupy. Tyler exists in an ideal movie world where the family has plenty of money, everyone’s faith is rich and strong, and he has nothing but love and support from all who know him. Everyone’s joyful and their neighborhood is immaculate. In terms of drama, they have nowhere to go. It’s infuriatingly predictable. Sentiment is laid on thick, insight comes only in cheap platitudes, and sappy songs play long and loud to inform the audience of how its supposed to feel. Worse, clear that the film isn’t about little Tyler’s struggles or having to confront his mortality at such a young age — the real issues children with cancer deal with — but about how great it is to have faith. It’s the worst sort of manipulation. This is a film to affirm how godly and loving the people watching it already are, and how they have all the real values. They’re the ones who will find this film “inspiring.” The rest of us will need insulin and some sinful Hollywood movies to recover. 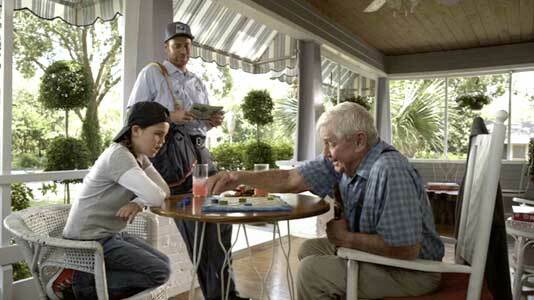 Sam mails the first letter in Tyler’s mailbox. 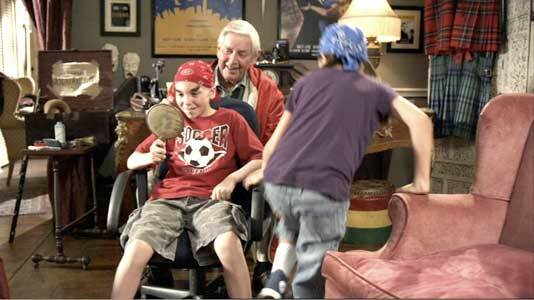 Tyler, Sam, and Kevin are sent to the principal’s office. Being a tomboy, Sam wears black chucks throughout the film. After shoving an intolerant jerk’s face into his lunch, she, the bully and Taylor are sent to the principal’s office. Later, when the three have become friends and are celebrating Tyler’s brief recovery, she wears red chucks to match her more appropriately girly clothes. Kevin, Tyler, and Sam outside the hospital. Letters to God. (2010) Robyn Lively, Jeffrey Johnson, Tanner Maquire, Michael Bolten, Marie Chetham, Bailee Madison. Directed by David Nixon and Patrick Doughtie. Categories: Drama, Family, Religious.